The second day of Charleroi Esports 2019 went much smoother in contrast to the first day which was full of blunders. The Group Stage came to an end with Sprout and G2 Esports making their way through to the Playoffs. FrostFire gave a good fight to LDLC in the elimination match of the Group-A. After loosing on Train quite bad FrostFire made a comeback on Mirage, winning by a score of ‘16-13’. The decider took place on Inferno where FrostFire hustled hard securing a lead of 9 round at the halftime mark but failed to see their way through as LDLC made a huge comeback to proceed onto the Decider Match. It was a fun day today. Unfortunately we are out of the tournament! Ggwp to @TeamLDLC ! @CharleroiEsport thank you the organizer for the amazing tournament and the hospitality here. 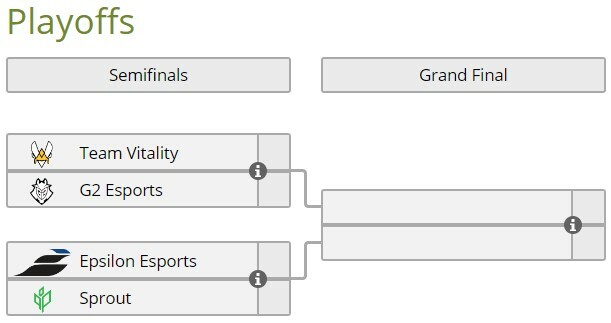 The Playoffs will be starting today with Vitality taking on G2 Esports whereas Epsilon goes up against Sprout. My best bets are on Vitality walking away as the winners but I am always game for an upset. Stay tuned to witness who walks away as the champion of Belgium's first ever international CS:GO event.